Vancouver, BC, Canada / TheNewswire / September 27th, 2018 – Equitorial Exploration Corp. (TSX-V: EXX, Frankfurt: EE1, OTCQB: EQTXF) (“Equitorial” or “Company”) announces that it will carry out a fall field program in the next weeks to map and sample the area surrounding the recently discovered Cat Tail Pegmatite at its 100%-owned Cat Tail Lithium Property directly adjacent to Quantum Minerals&apos; Cat Lake Mineral Project. - A significant spodumene (lithium mineral) bearing pegmatite (Cat Tail Pegmatite) was encountered in four of the drill holes. Prior to being drilled, this pegmatite was buried with no surface expression. The 2018 fall field program will consist of mapping outcrops on the claims, rock and biogeochemical sampling. This work will focus on obtaining a better geological understanding of the property and prospect for any additional pegmatites. A biogeochemical orientation survey of spruce bark sampling will be conducted over the Cat Tail Pegmatite to see if the pegmatite can be detected using biogeochemistry. The company plans to carry out a Phase Two drill hole program on the Cat Tail Pegmatite to further explore the lithium and tantalum potential at depth and along strike. A drill work permit has been applied for with the Province of Manitoba and the company is awaiting approval. The company plans to initiate a PEA (Preliminary Economic Assessment) Study after the completion of the Phase Two drilling to evaluate the economic viability of the Cat Tail Pegmatite. Carey Galeschuk. P. Geo, a consulting geologist with extensive experience in rare metal and lithium-bearing pegmatites serves as the company’s Qualified Person for the purpose of National Instrument 43-101. 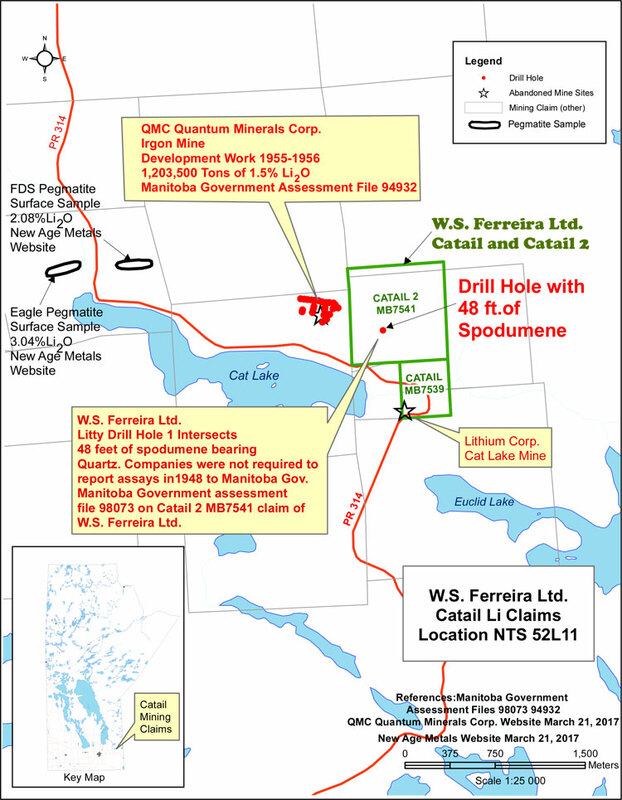 - Property situated directly east and along strike of Quantum Minerals&apos; Cat Lake Mineral Project (previously Irgon Lithium Mine). During 1956-1957, the Irgon Mine was an underground mining operation for spodumene (one of the hard rock sources for Li). The pegmatite had an historic estimate of 1.25 million tons of ore grading 1.51% Li20 (Mineral Inventory File No. 221). Geologically, the property lies within the east-trending Mayville-Cat-Euclid Greenstone Belt (“MCEGB”) located along the northern contact of the Maskwa Lake Batholith. This northern greenstone belt has a similar structural geological setting as the Bird River Greenstone Belt (“BRGB”) which is located along the southern contact of the same batholith, and is parallel to and approximately 18km to the south of the MCEGB. The property is located 20 kilometers north of the Tanco Mine Property. The BRGB hosts the world-class Tanco rare metal-bearing pegmatite as well as numerous other lithium-bearing pegmatites. The Tanco Mine went into production in 1969 and produced tantalum, cesium and spodumene (lithium). It was previously North America’s largest and sole producer of spodumene (Li), tantalum (Ta) and pollucite (Cs).